Here's the recipe for yummy cake I made for Easter 2009. I loved it and ate it all week long. The recipe is an adaptation (mostly a reduction) of a reader's submission that appeared in May 2009 Bon Appetite, p 16. Frosting: With an electric mixer, beat cream cheese and butter until smooth. Beat in sugar, then jam. In separate bowl, beal whipping cream until stiff peaks, then fold into butter mix. Chill, covered, 2 hours or until firm. Cake: Preheat oven to 325 degrees. Grease 2 round 8-9 inch cake pans. Sift dry ingredients in a large bowl. In a med bowl, mix sugar and butter until fluffy. Add eggs and vanilla, then sour cream (beat 30 secs). Stir in flour mixture, beating well after each addition. Divide batter between pans. Bake cakes until toothpick comes out clean, 45 min or so. Cool in pans for 10 min, then remove to cool completely. To assemble: Cut cake in half, using serrated knife. 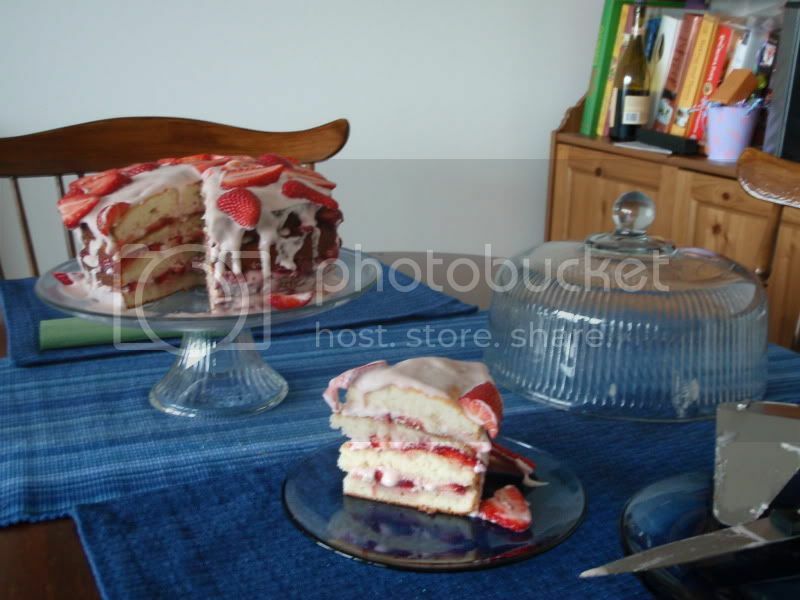 Place first cake half, cut side up, on platter, spread 2 T jam, then strawberries, then frosting and top with other cake half. Repeat 2x. 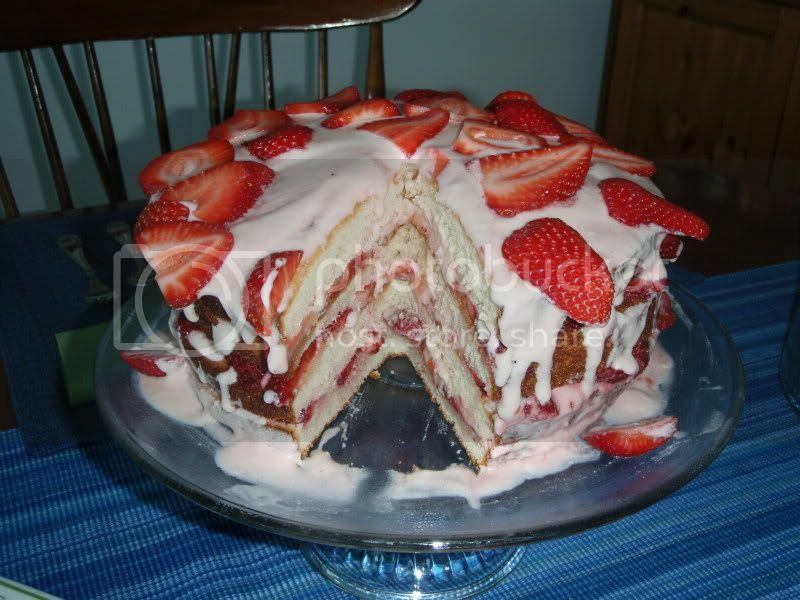 After placing top layer, frost completely and decorate with remaining or additional sliced strawberries. Chill until ready to serve.